The first three parts of this series1, 2, 3 have described the time-dependent processes that provide a plausibly likely pathway from the production and evolution of various atomic and molecular species through the formation of huge collections of varying complex chemical mixtures under early earth conditions. The story continued with the general application of common physical activities and phenomena that would have commonly led to their packaging within simple membrane-enclosed volumes of such mixtures and their dispersal into new extracellular aqueous media. This current chapter in pre-biotic evolution looks more closely at that and begins to mate these energy-requiring functions with energy sources and the growing complexities of a fully competent, self-sustaining version of protocell. rules of lipids in water became the method and means for future combinations of these sequential functions to extend their evolutionary story through. Simple fusion of all possible combinations then could have created brand new levels of complexity in which multiple end-products of simple pathway operation would have been generated in proximity with one another. Such concentration of multiple new metabolic end-products within single protocells now allowed larger scale leaps in the evolution of complex cell structure, design, operation and functioning. At that point the rate at which evolution of inanimate matter into a truly self-sustaining state must have greatly accelerated. With multiple occurrences of such breakthroughs at each of those critical points, this pre-biotic epoch appeared unchanging to the naked eye while major microscopic and chemical changes in growing complexity sprung forth on earth. Looking back in retrospect at different pathways within modern life’s biochemical pathways and sub-cellular structures, we might very well be seeing a journal of the most successful types of ancient protocells that ultimately produced the first self-sustaining “living” early cells. For example, the glycolytic pathway, an important pathway in most anaerobic as well as aerobic procaryotes and eucaryotes, regenerates adenosine triphosphate (ATP) from adenosine diphosphate (ADP) and inorganic phosphate in modern organisms as it breaks down six carbon carbohydrates down to 3 carbon forms in the initial stages of their complex energy-extracting metabolism. This part of the modern cell’s overall metabolic pathway complexity, composed of a small number of sequentially-operating chemical catalysts (i. e., what are now called enzymes) could very well have developed through combinatorial chemistry followed by self-selection. If then captured within liposomes as a “starter set” within a relatively few early pre-biotic protocells, this would have given them certain advantages over the many other kinds of protocells they were mixed in with in various niches around the early earth. But some of those other types of protocells must have had their own fragmentary reaction sequences operating that, if combined within some future hybrid already possessing the glycolytic reaction sequence, then provides that evolutionary quantum leap to a new set of survival capabilities. See Figure 1. Figure 1. Protein-rich protocells with differing sets of contained unitary functions produced in uncountable numbers must have been a common occurrence in many niches on early earth. Examples might include an ocean foam collecting at the water’s edge on a beach or a kind of bubbling, floating pond scum. Mixing of such collections in a somewhat random fashion would have been accompanied by all manner of fusion hybridizations between these different parental lines of biochemical and biophysical function-carrying units. It is not so difficult to imagine that when a few of these functional pathways combined into a single protocellular package it could have generated a major enhancement in its survival properties and thus ability to persist. And as those more successful hybrids out-performed and multiplied by simple physical scission in flowing rivulets and crashing waves, each resultant metabolizing vesicle regenerated more of its unique collection of molecules. Their overall numbers then could preferentially increase over the less functional previous forms. Once this new hybrid became dominant, further mixing and fusions with other functionally distinct protocells would allow subsequent quantum leaps of development to become the newest dominant forms. At some distant step in this fusion recycling, the independently free-living protocell would have come into existence. No one should ever expect the formative steps of life on earth to not have been hap-hazardous, chaotic but bordering on random, irrational or inelegant. Nature is really messy that way. The march to a living state had to be a very crooked one at best. Though not the current prevailing view, this piecemeal building up of cellular complexity derived through a long series of steps involving protocellular fusions could also provide an even more important level of understanding. This step-wise combining of already self-assembled and self-selected functioning protocell units presents a natural explanation for how the membrane-bound nucleus evolved in eucaryotes and even how multiple individual chromosomes came about in more complex asexually-reproducing modern uni-cellular types of free-living cells. This evolution-controlled formation process could also be extended to explain how and from where other types of subcellular structures were derived. It would explain the earliest origins of functionally separate sub-cellular structures such as lysosomes, peroxisomes, Golgi apparatus, ribosomes, microtubules, actin and myosin-related dynamic structures, endoplasmic reticulum membrane vesicles, and various kinds of storage, excretory and secretory vacuoles. More elaborate and convoluted histories must have been followed however for the ultimate incorporation into early evolving protocells for the modern day, double-membrane chloroplast, mitochondrion and membrane-enclosed “super-control room”, the eucaryotic nucleus. These subjects will be individually explored in future additions to these articles. Such an incomplete picture then provides a somewhat mechanistic but still far-removed protocellular structure because no continuing energy-related processes are present or linked to the static metabolic schema that would have existed at that point. Ultimately we need to now focus our attention on the energetics of what has developed in this picture to convert the finite existence of such protocells to a continuing, dynamic, persistent form we have come to know as organic-based terrestrial life. This may not be the only such pathway but is argued to be a logical, consistent and realistic one that merits serious consideration. In a previous part of this series, the author described the characteristics of a living system and alluded to the structural and mechanistic features that imbued that system with what we all must ultimately agree is the essence of the living state. Life can be recognized as a persisting active, thermodynamically “uphill” set of processes contrary to what would happen if allowed to become depleted of energy sources and undergo normal spontaneous changes. This has often been referred to as negatively entropic and focuses on the fact that instead of living cells slowly dissipating like a cube of sugar dissolving in a glass of room temperature water, they continuously work and function to hold together, repair and replace their losses in structural components and their non-random organization. And here we are referring to the persistence of cells between their reproductive cycles. That is an energy-requiring process. Such behavior requires a continuing resupply of useful forms of energy and raw building materials to draw upon for this self repair behavior to out-perform Nature’s ever-present deteriorative influences. So we might best be served in seeking a more detailed definition of the living state and how it is connected to energy sources. Let us approach this by first defining the non-living, or dead state. The most basic unit of life, an individual, free-living cell, can be in a living state one moment and dead in the next. The difference is that the living version will persist indefinitely if continued to be supplied with all it needs to maintain its structure, composition and internal dynamic operations. The dead cell will be irreversibly changed to a state where the structure and all organized and reorganizing processes cease. It will no longer persist as that meta-stable processor of matter and energy. In life, the cell behaved as a homeostatically-operating, steady-state flowing, chemical processing unit. It is both a delicate and robust thing, the living cell. And it has a continuing need for energy and raw matter input from which it maintains its overall structure. To find the thing that physically defines that living state, one must closely observe, probe and analyze a living cell and follow the changes in it when a lethal injury is applied. The simplest type of injury that can cause cell death is a rupture or uncontrolled leakage across the outer membrane of the cell. Once such a breach of the plasma membrane occurs, extracellular fluid and its dissolved substances flows in at a much greater rate than it would if that membrane were intact. At the same time, intracellular contents also uncontrollably leak out. At the end of this injury scenario, the cell plasma membrane, like an empty burst balloon, floats away from the discharged dissolved cytosolic substances, the gelled cytosolic proteome, and sub-cellular debris. The dead cell debris that used to be the nucleus, mitochondria, lysosomes, peroxisomes, endoplasmic reticulum, as well as any other specialized structures characteristic of the type of cell last only a short time before they also degrade. In the living state, the semi-permeable plasma membrane completely enclosed and originally maintained a highly asymmetric set of concentration gradients, both inwardly and outwardly directed, in a permanent non-equilibrium condition. It takes energy to maintain these gradients and part of the cell’s energy design is devoted to continuing to rebuild those gradient processes. Thus the one thing that is always a marker for cell death is a loss of the ability of the cell to continue to maintain its internal milieu within very narrow and vital chemically-defined limits. Internal dissolved calcium ion concentration in the cytosol compartment of modern eucaryotic cells typically ranges from about 10-8 up to 10-5 molar during various aspects of the cell’s life. Important internal increases and decreases in cytosol calcium ion concentration are controlling features of the animal cell division cycle. It is a key indicator of the biochemical activity patterns in operation. But when approaching 1 millimolar in concentration, the cytosolic calcium concentration becomes a harbinger as well as agent for the cell’s death. It directly causes loss of viability and the cessation of all its previous life processes. The modern eucaryotic cell possesses multiple types of membrane-enclosed compartments. Of course the outer plasma membrane provides this function for the cell as a whole, allowing it to maintain a different chemical milieu from the surrounding fluid. Each type of sub-cellular organelle that has an uninterrupted enclosed membrane-bound volume also contains its preferred optimum milieu compatible with its unique chemical reaction sequences housed within. All such membrane-bounded compartments must forever maintain the integrity and limited permeability of those internal compartments for the cell to remain in a completely viable condition. Within a modern eucaryotic cell, the primary chemical reactions housed in various sub-cellular organelles frequently have quite different and conflicted optima for pH and other chemical reaction requirements. The enzymes located in one compartment could rapidly destroy the enzymes or intermediates if they had access to the contents of other compartments. The limited permeability and macro-molecular barrier functions of most cell membranes also provides protection and isolation of incompatibly self-destructive portions of the cell’s metabolic operating parts. The semi-permeability of all such isolative membrane systems is also a long term requirement for generating and storing energy and creating each of its functional molecular parts. In that sense it furthers the maintenance of the living state as well. These facts are important to appreciate when looking for the clues to how life on earth began and then continued to evolve and improve its ability to persist, if not grow. For without semi-permeable membranes and the necessary bioenergetic apparatus presenting itself in a life-compatible condition during the time of first capture, our protocells might form but not be able to persist. In a somewhat literary sense, we can infer that the “vital energy” possessed by all living things can be biophysically defined in terms of chemical and electrical properties of the cell membrane and chemical gradients as produced through the asymmetric transport and longer duration storage of a multitude of differing chemical species. When biophysicists characterize modern cell plasma membranes, whether from procaryotes or eucaryotes, virtually all normal nutrients, specific cell secretory products and waste products transfer through such membranes by way of specific or relatively non-specific transport molecules or channels in those membranes. If we begin with more of substance A on one side of such a membrane than on the other, the natural or spontaneous tendency is for such a gradient of concentration of A to flow in a net fashion from the higher to lower concentration until it arrives at final equilibrium concentrations. Those concentrations, or more formally, the chemical activities, becomes equal on both sides. Even at equilibrium, the transfer of molecules or atoms of A continue, but the transfer rate in one direction would be equal to the back transfer rate in the other direction in a non-energized, permeable. It is here that a series of seminal events took place during the early origins of life on earth. These events must have occurred over a long period and many variations must have been present simultaneously. In a very real sense, development of trans-membrane transport mechanisms must have followed a similar script through the genesis engine of combinatorial chemistry. That continuously operating agency would have led to the highly diverse molecular species that became available as the early building blocks of the membranes that formed the basic protocells. These events included the development of passive, assisted and active transporting systems that not only spanned those protocell membranes, but were themselves asymmetrically co-orientated in a group fashion across such membranes. These allowed dissolved substances that could closely interact with them to essentially move in one direction and not in the other direction, very much like a check valve or back-flow preventer in a water pipe. So how could a collection of transport molecules get embedded in a phospholipid bilayer membrane all in the same trans-membrane orientation? If combining in a purely random fashion, equal numbers of a given trans-membrane transporter could become embedded in a membrane oriented in opposing directions. That would not only be self-defeating, it would eliminate the ability for that membrane to be able to generate a chemical gradient across it. Transport molecules are typically protein in composition. They are uniquely composed of chains made from a combination of varying length sequences of more highly polar amino acids joined to internally-connected sequences of lower polarity, lipophilic amino acids. The lower polarity sequences generally anchor the middle of transport molecules within the phospholipid membrane interior. They control the way in which the secondary protein structure forms through folding of the more polar portions of the chains. Those more polar regions are hydrophilic and closely connected to the aqueous medium on either side of the membrane. The more polar sequences and regions of the protein’s amino acid sequences are usually found either extending out from the membrane surface and into the highly polar aqueous phases on either side of the membrane. This makes them more “visible” or accessible to the kinds of molecules that are seeking passage through the membrane. Such polar amino acids can also be found in a hollowed out, tubular interior of the protein. These interior trans-membrane pipelines with polar groups projecting inwards, create trans-membrane channels possessing more selective size, charge polarity and geometric constraints for what kinds of substances can pass through them. They are similar to the same chemical criteria found within an enzyme’s active site. Such membrane-compatible protein molecules when free can form quasi-crystallized, weakly-aggregated films at or near air-water interfaces. If phospholipids are also present, these amphiphilic molecules spontaneously form mono-, bi- and multi-layered membranes that spread across the surface of any available water-air interfaces. Their appearance is quite like that of the black and multi-colored sheen of water contaminated by petroleum oil. They have a strong tendency to keep spreading thinner and thinner and if the surface area is large enough, black single bi-layer membranes form. The co-presence of what we might call proto-transport molecules floating as a regularly-ordered, two-dimensional, quasi-crystalline aggregate just under the bi-layer allows them to approach the bi-layer from one direction and become embedded in it in a uniformly oriented fashion. An alternative means of accomplishing this same goal could utilize a solid mineral surface that presented adsorption sites for the proto-transport molecules to first attach to. 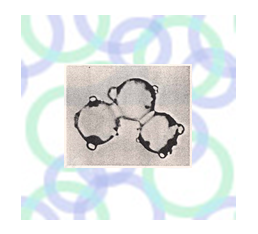 Following attachment to the mineral surface, the floating phospholipid bi-layer could be juxtaposed to that surface through direct contact streaming or evaporation of the water phase with deposition of the bilayer onto the protein-coated surfaces. The result is a transfer of the proto-transport protein molecules from the mineral surface to a single side of the bi-layer membrane sheet. And once this formation of an asymmetrically distributed collection of protein molecules is completed, uni-directional semi-permeability and asymmetric chemical reactions can take place across the membrane after enclosed vesicles are produced from such larger sheets through different types of physical agitation. Such a mechanism for the formation of asymmetric membrane functions would ultimately be highly inefficient and lack stability and reproducibility. This set of events are simply offered as a short term means to an end. That end is the final bringing together of all the necessary structures, activities and components that are finally capable of indefinite persistence, and packaging them within a membrane-bounded, single small vesicular volume. In other words, the crucial point in which they have the basic starting capabilities of life. Up until now we have only looked at the chemical complexity, reaction conditions and ability for a protocell membrane vesicle to concentrate and maintain a gradient across its membrane. The generation of the gradient, requiring an external source of usable energy, is very much analogous to a rechargeable battery. The external energy source would be the recharger plugged into its energy source. In the battery model, initially electrically net neutral chemical species are dissociated and actively separated or pulled into different fluids. The oppositely charged particles move to opposite sides of a semi-permeable, somewhat electrically insulative bridge or barrier. If it is too highly insulative, it can store the charges for long periods but then they are greatly retarded in their movement back through the barrier. That limits the rate that such a field can be subsequently utilized to perform other work. So to operate properly, this barrier must still be slightly conductive in order to allow oppositely charged particles to pass through at a useful rate and allow the charged particles to rejoin and neutralize their free charges. In cells, that barrier is the phospholipid portion of the bilayer membrane. Thus, across various cell membranes, if such electrochemical reactions take place asymmetrically across those membranes, charges can be separated and stored for various amounts of time across a two-dimensional surface. This becomes a direct simulacrum to an electrical capacitor. If an electrically-charged capacitor is subsequently connected to an electric motor, that stored electrical field energy can drive the motor as the potential electric field energy collapses and the charges flow back together to reform electrically neutralized species again. In a more fundamental fashion, electrochemically charged membranes can provide a moderate amount of electrical charge storage and a means of tapping that stored energy into various types of useful work when the cell needs such input to extend its existence and persist. The first free-living protocell was the original Walkman. Useful energy storage can also be obtained through simply moving non-dissociable molecular or atomic species from one side of the membrane to the other, to form a simple concentration gradient of a neutral non-ionizable chemical compound. Such a type of energy storage is more analogous to a dam that collects water and then can be linked to some energy-converting mechanism, such as a hydro-electric power station or a simple water wheel. It is also analogous to the physical work generated within a growing plant as it rises out of the soil and gains new height against gravity through forces generated by osmotic pressure. The usable energy, or work, in this latter example is performed from building up the potential energy by movement of water molecules from one side of semi-permeable membranes to the other. That forces the water collected on one side of a fixed volume cell to be at higher pressure relative to the other side. Thus osmotic pressure is also equivalent to stored potential gravitational energy. The system’s natural tendency creates this type of energy storage whenever non-ionizable substances are actively transported across membranes. The gradients they form have the natural tendency to spontaneously return to their equilibrium distribution of the various compounds and water of solvation while in earth’s gravitational field. In our actual cell, the concentration gradient is driven by attracting more water to one side of a water-permeable membrane through addition of more non-dissociable particles to that side. This can be accomplished in several ways. One simple way is to have a trans-membrane transporter move a single molecule from the outside of the cell to its interior where it is subsequently split into two molecules. Osmotic pressure is based upon simple numbers of particles that are solvated. The thermodynamic behavior of this extra energy is then stored in the form of the heats of hydration for each of the transported species plus net movement of extra water towards the side needing added water for solvation. If the volume of that side is forced to be constant, that drawing in of the extra water would be converted to a physical force or pressure. That is the fundamental cause of osmotic pressure. And for completeness, it should be stated that osmotic pressure can be associated with either ionizable or non-ionizable soluble matter. All living cells are involved with both kinds of energy storage. Certain states can exist, such as within ungerminated spores and suspended animation, that do not necessarily preserve those qualities during such transient states. Thus we can allow for a living system to become temporarily “non-living” during suboptimal conditions and re-start again after restoration of minimally supportive conditions. For all of the functioning that we have previously been looking at, we have to still describe how chemical or physical energy taken in by the early protocells was first converted to a storage form, then stored for extended periods, and subsequently linked to and drawn upon to energize various life processes during energy-poor moments. Those non-equilibrium concentration gradients spanning across membranes, and electrical fields located on the membrane surfaces, need to be able to be physico-chemically linked to molecular engines or processes that can only continue to operate by absorbing useful energy from the gradient and converting it into new cell “stuff”? Let’s look briefly at the energy contained within chemical gradients. A well-known relationship was described by early electro-chemists between the relative difference for the concentration gradient existing for two aqueous solutions of a charged ion separated across a semi-permeable bridge and the strength of that species’ tendency to return to equilibrium through transference of negatively-charged electrons. The physical form that this type of energy storage manifests is as an attractive electrical field created between oppositely charged species separated by the thickness of a relatively low-conductive dielectric membrane. Different ions have different intrinsic dissociation energies based on the electronegativity and electron configurations of the atoms that compose them. As the science of electrochemistry developed, electron transfers were found to occur not only between two identical-type ions simply based upon their relative concentrations in two different solutions, but also between different ionizable species. But such phenomena have been occurring throughout the entirety of earth’s history without the intervention of Man. Such electrochemical reactions existed before the first protocell was capable of forming on primordial earth. As general features of such reaction chemistry, the following should be noted. All electrochemical reactions can occur in aqueous media (there are non-aqueous electrochemical reactions but those will be reserved for our future considerations regarding origins and evolution of extra-terrestrial life). As electrons are transferred from one ion to another, water molecules are included in the reaction steps. This leads to a simultaneous uptake or release of protons causing the reactions to also be affected by, and be capable of changing, the pH of the medium. Useful work can be effected if the two reacting species, also known as half-cell reactions, are first separated by a semi-permeable bridge (salt bridge) or membrane possessing selective channels connecting the two reacting solutions. Such a path is needed to allow the net flow of one type of ion in the appropriate direction, depending on whether the gradient is being recreated by an energy-utilizing regeneration mechanism or allowed to flow back spontaneously towards its equilibrium point by some kind of work-accomplishing process. Such a system is mimicked by standard man-made rechargeable batteries. Asymmetric chemical catalysts and electron carriers and their attendant reactions are commonly found embedded in and spanning biological membranes. If one has two such selective membranes separating three different solutions in tandem, this would increase the electrochemical potential in the same way that two standard batteries in series would double their combined output voltage. This pattern is also analogous to that of the eucaryotic cell in which the extracellular medium is separated by the plasma membrane from the cytosol and the cytosol is further separated from the inner mitochondrial matrix by the inner mitochondrial membrane. Such a stacked strategy is also found in the electrogenic glands of the electric eel, Electrophorus, as well as in stacked flattened membrane vesicles in chloroplasts (thylakoids) and photosensitive retinal cells. Synapses within the nervous system have a similar but less recognizable similarity to such stacked membrane vesicle packages. But in each of these examples, gated flows of ions and non-dissociable chemical species flow into and out of those individual compartments while being apposed to other membrane-bounded compartments or cells. This gives rise to the well-known action potential behavior of excitable membranes. And that is also a commonly found trait of such electrochemically energized membrane phenomena. For this reason, it might be reasonably expected that not only were simple membranes required at the dawn of the living state, but a low grade version of a gated, excitable membrane’s type of behavior would have presented exceptionally enhanced survival advantages to whatever protocells had developed it. This multi-compartmented design of the eucaryotic cells however is much more complex than this. Multiple chemical species are separated among these three aqueous compartments. Each relatively impermeable to the phospholipid membrane framework but is transferred through the membranes by selective carrier or transport molecules embedded in the membranes. The membranes also isolate and help maintain differing pH, chemical and ionic compositions between compartments that are optimized for the specific kinds of compartment-specific enzymology contained within those same compartments. Osmotic pressures are relatively well-maintained across each type of membrane. The membranes also isolate the biochemical reactions in one compartment from potentially incompatible reactions going on in another compartment. Some of the reactions taking place across a given membrane are of an electrochemical nature. For those reactions, the protons or electrons must pass through the membrane channels or transport molecules and during that passage, useful chemical work is capable of being coupled to them. In energy-capturing membrane structures such as thylakoids in chloroplasts, this process works in the reverse direction under illumination and generates the pH gradients through electrons being first raised to excited states by photon absorption followed by linked chemical reactions being driven by them as they return to their ground states. Those reactions are of the utmost importance in the evolution of life on earth. For those reactions finally link all life on earth, directly or indirectly, to the main form of energy output of our nearest stellar neighbor, the Sun. These will be considered in greater detail later. This relationship exists for each type of ion that can move across the membrane. There are many kinds of ions that transport across membranes and this relationship exists for each type. Other equations have been developed to better describe biological membrane potential. The overall resultant electrical potential is the mathematical sum of each ion’s contribution. In resting animal cells, the plasma membrane typically exhibits a resting electrical potential of about 70 millivolts, outside negative. Whenever a cell becomes active, ions flow in and out of the outer membrane and the membrane potential changes in either a depolarizing direction or a hyperpolarizing direction. All of these properties and variations are intrinsically part of and define the living state as contrasted to a state of death. The alternative, a state of pre-biosis in which life’s processes have never previously occurred within an early version of protocell, would also be found in a similar equilibrium or near equilibrium condition. As any chemical species, ionizable or non-ionizable, moves through its preferred molecular channel from one side of a semi-permeable membrane to the other, water molecules to keep each ion or molecule in solution must follow. As previously described, the phospholipid portion of the biological membrane has an important property in that at normal growth temperatures it allows the smaller water molecules to easily slip between the hydrocarbon chains making up the interior of the bi-layer. Membranes have elasticity, plasticity and resilience. This provides a back pressure to resist the continuing and unlimited movement of solutes across that membrane. Biological membranes have some interesting behavior as they are stretched by osmotic swelling. They become more non-specifically permeable to smaller ions and molecules. As the membrane is further stretched, larger molecular weight ions and molecules and even macro-molecules begin to passively leak back down their concentration gradients. When cells are osmotically over-stressed even further, macro-molecular solutes in the cytosol slowly exit the cell through the unbroken, but now more “porous” plasma membrane. Even molecules and ions that normally move through specific transporter membrane proteins can also flow through these non-protein leakage pathways. These capabilities are both important and useful to understanding how the self-assembled pre-biotic membranes must have behaved as the first “life-capable” membranes could have formed for the first time. Our origin of life model must also include an adequate and plausible description of how all of the starter molecules necessary for a rudimentary metabolism were captured by the first pre-biotic liposomes. Further, our narrative must also have a basic set of means (trans-membrane transporters) by which necessary substances move into and out of those early cells. But even with all of that inventory list of life’s minimum necessary molecular content, we must also include a rudimentary energy-capturing and/or energy-converting mechanism that could collect, store, supply and recharge the necessary forms of energy needed to keep all of the internal chemical and physical activities continuing indefinitely thereafter. It is here that our greatest challenge to life’s genesis will probably be found. So how does one combine a set of uni-directionally selective, asymmetrically and uniformally disposed membrane transport molecules? How can one understand the first genesis of sets of sequentially-operating enzyme complexes and then finally find a plausible and testable means of linking the internal reaction chemistry to the active transport of ions and molecules across the membrane against their concentration gradients? Each of these collective functions embodies a number of types of molecules having to be maintained in close proximity and accurately juxtaposed to one another for extended periods of time. The combined functions taken together creates an almost insurmountably complicated perception of a collection of components that behave with integrated complexity. The whole seems much greater than the sum of its parts. It is almost like trying to build a tall house of delicately balanced cards beginning at the top! But remember, we have already described a relatively direct means of bringing all these functional units together. It is through the prior formation and then subsequent hybridization of each functional type of protocell. The first generation of protocells captured and utilized formative sequences of combinatorial chemical reactions. Multiple liposomal formation captured differing collections of molecules, that is to say, different rudimentary but operating fragments of biochemistry. The second generation of protocells then could form following fusions of different functionally distinct types of liposomal ensembles. The more successful combinations self-selected and became the dominant types in their niches. Life would not be held in abeyance for long. It was trying to develop all over earth and at probably more than one location, it would finally become fully capable of unlimited growth of mass and able to begin actively sensing its chemical and physical environment. And that sensing allowed it to become more tropic… more able to seek out and meet its needs for energy, raw materials and optimal growth conditions. At this point our protocells are beginning to “come alive”. But there is much more to the story before they can be officially called alive! © Copyrighted by Joseph H. Guth, 2016. All rights reserved.